Hi, Good Morning, Thank you, friends and viewers. Today I will post how to make sojjappalu recipe. Ah! 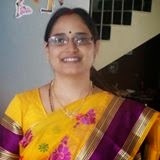 after 10 days of hectic schedules of puja, making different varieties of dishes and arranging bommala koluvu and also visiting the temple for bathukamma, today I am really feeling relieved of stress. We celebrate two festivals at a time, one is our custom of arranging bommala koluvu and the other is going to temple for playing and watching bathukamma a floral festival of the state of Telangana. It is a vibrant and colourful festival with a lot of flowers arranged on a plate in a circle. All the bathukammas are brought to one place and ladies play around them in circles. While playing they sing nice folk songs. Really it is a must watch and the way it is played is a good exercise also. 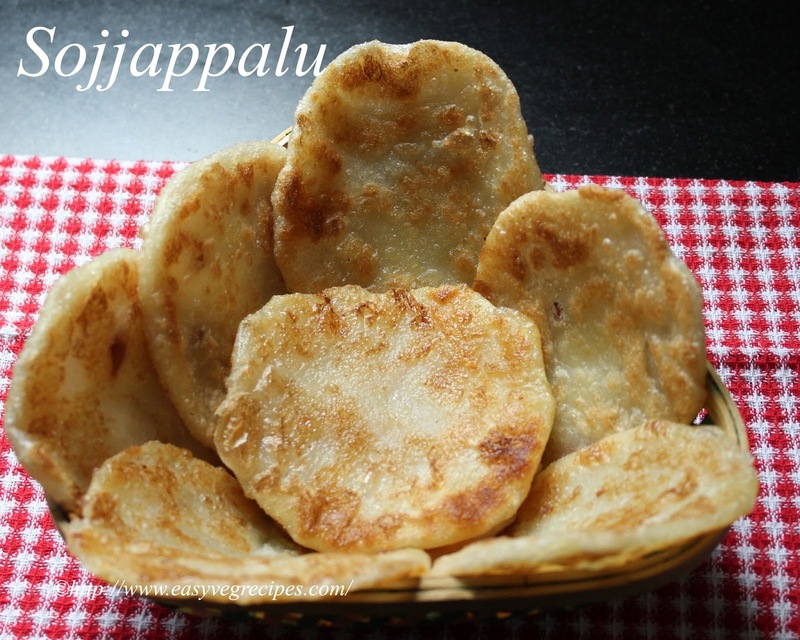 Now coming to the recipe, it is a sweet made with sooji and a special to Telugu states. This is made especially during Diwali. We have to deep fry them. I was always hesitant to make them because of deep frying, but my mom gave me the idea of shallow frying. I tried it, the taste is awesome and I fell flat for the simple procedure. My mom is an expert in making it. In a wide plate mix maida and little amount of water to make a smooth dough like that of roti. It can be a bit loose also good. Knead the dough to make it smooth. Add oil to it and again knead it. Add oil slowly, do not add all at once. Coat the dough with oil. Oil should be visible. Heat oil or ghee in a thick bottomed kadai, add sooji and fry it till the aroma come up. Keep it aside. In the same kadai, add water and milk. I prefer to take 1:1 ratio of them. You can change the ratio as per our taste. 2:1 or 1:2 of water and milk. Let it boil and add sugar to it. Mix it well and let the sugar dissolves. Once sugar dissolves and the water-milk mixture starts boiling, add suji while stirring continuously. Mix it well so that no lumps formed. Cook till the suji combines well and forms as a single mass. Add cashew nuts and mix it well. To check the consistency of the filling, take a small portion of it if you are able to make a ball out of it without sticking to the hands. It is in the right consistency. Let this filling cool to handle. Make small lemon sized portions of it. Make the dough also small lemon sized portion. Wet your fingers with oil, flatten the dough portion like that of the roti with the help of fingers as thin as possible. Place one portion of suji filling and cover it with the dough. While patting with the fingers spread it into a small 3 to 4" diameter circle. It should be thick. Heat oil in a kadai, slowly drop this sojjapppam, fry till it turns light brown. I already told, I shallow fried them. 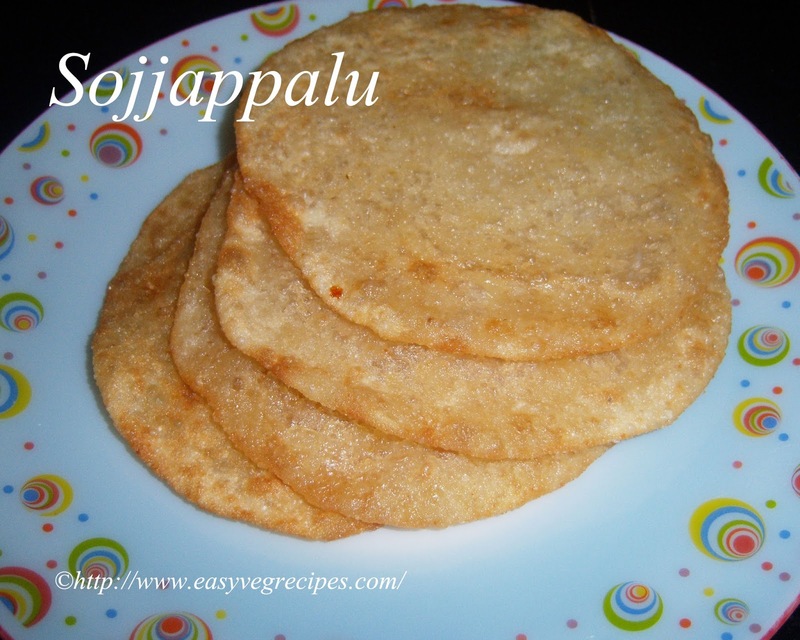 Heat dosa pan, cook the sojjappam with one spoon of oil or ghee on one side. Flip and cook on the other side with one spoon of ghee or oil. Take them onto a wide plate. Serve them anytime hot or cool. But do not chill them.